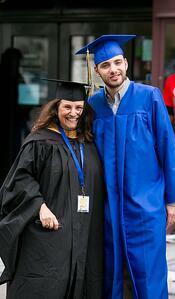 When Aaron Kirschenbaum walked across the Paramount Theater stage on May 23 and received his Associate of Arts Degree in Child Development from Merritt College, it was not only his parents and grandparents in the audience who were thrilled see him reach his goal. A team of instructors and counselors who had worked with Aaron at Merritt to achieve his dream were in attendance and cheering just as loudly. Two years earlier Aaron was a newly arrived freshman having recently graduated from a private high school in Lafayette designed for students on the autism spectrum. With a goal of going to college to learn to teach pre-school children with special needs, Aaron chose Merritt College for its excellent Child Development Program and its highly reputable Student Accessibility Services (SAS) program to help students who may need some extra support to succeed. It turned out to be a wise choice. Through a team effort, with Aaron at the helm, he was able to graduate and will soon be using his education and experience to help others. So Christine met with Aaron’s SAS counselor, Mary Ciddio, and his academic case manager, Stina da Silva, from College Internship Program (CIP), a Berkeley-based agency that teaches skills for independence to students with learning, some of who are pursuing college degrees. Together they set up a plan to overcome his challenges so he could pass the class and graduate.